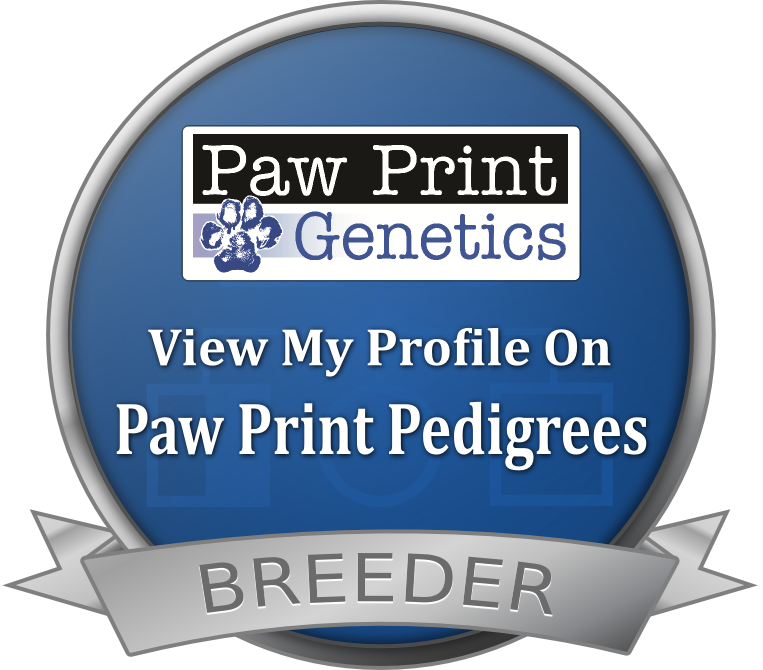 "Our breeding dogs are ALAA DNA Profiled. All of our breeding dogs have been DNA'd and their DNA profiles have been submitted to the ALAA. This has been done to protect the buyer and support parentage identification. We are proud to be an ALAA/DNA breeder." Colder is absolutely the sweetest boy! He has mesmerizing green eyes and a gorgeous, soft wavy fleece, white & caramel coat. He is one incredibly laid-back, stud muffin. He lives with our daughter and her family and they keep him busy. He has become a social butterfly and mascot attending travel ball games. Colder is one dedicated fan. Colder loves life and every moment in it, whether it is a car ride to a sporting event or a walk through the hardware store...he is ready. The frisbee is one of his favorite backyard pasttimes. In the summer months he enjoys cooling off in the pool with the kids. As our daughter, Allison often tells us, "Colder is the Rolls Royce of all puppy dogs. You can ask him for a hug and he leans on you...Colder melts your heart...."
Stud Services available with Colder Baby! We waited, we persevered, we had patience, we hoped and we prayed for the right boy and at long last, ALONG CAME “CHARLIE”! Charlie has it all!!! He has gorgeous hazel eyes that are both mellow and warm. He has a beautiful stocky build with a soft, wavy fleece coat you want to sink your hands into…he so loves his rubs! Charlie is extremely loyal, always remaining close by and so very much enjoys his daily long walks. He is very observant and a wonderful watch dog. Charlie has absolutely no fear of new sights, sounds or meetings and he holds his head up high. He has an extraordinary social IQ. He assesses new situations, new meetings for a brief moment and carries on as though just meeting his very best two or four-legged friend(s). Car rides are his very favorite! Charlie wants to be a part of your daily journey, where ever it takes you, he wants to be by your side through it all. Stud Services available with Charlie! Finding the perfect miniature, ginger stud muffin to add to our Breeding Program has been quite the quest. It tested my patience throughout months and yes, years of searching and anticipating. Our little snuggle bug, Hugo is well worth all the diligence! He is a lovable, eager-to-please, very smart, soft Teddy Bear with a huge heart. Hugo is without a doubt a two and four legged Chic Magnet. He loves to socialize, no matter what the event and is always the center of attention. He looks forward to his daily walks chasing the leaves and, listening and observing the goings on outdoors. His toy box packed full of treasures to play with in the morning and empty by days end, is strewn throughout the entire house. The sight makes one laugh knowing this silly boy had a great day. We look forward to watching the beginning of his legacy develop the end of 2018. Great things do come in little packages. Stud Services available with Hugo January 2020!